When H.C. Muddox was founded in 1878, it was producing many of the sewer pipes, bricks, chimney flues, and other building materials that were used to construct the region’s original buildings. 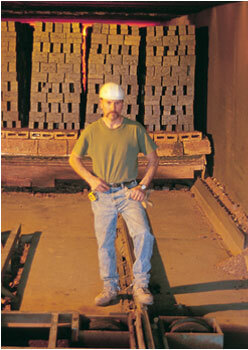 Eventually, the demand for brick caused H.C. Muddox to focus its resources on becoming one of the region’s leading brick manufacturers. H.C. Muddox joined Pacific Coast Building Products in 1980 and now supplies a large distributor network with clay products that include standard face brick, thin brick, flue liners, pavers, pool coping, and structural brick. H.C. Muddox also offers custom shapes, sizes and colors in a range of products. The abundant, high-quality clay deposits that started H.C. Muddox will continue to provide raw materials for years to come. Combining the colors and consistencies of the clays and firing to different temperatures brings out the variety of warm earthen tones that are the company’s trademark. H.C. Muddox assists architects, owners and contractors in selecting the right product for the job. Whether it’s Thin Brick, Face Brick, Structural Brick or Paving Products that your project requires, H.C. Muddox is ready to assist you in your selection and guide you through the process of design and application. H.C. Muddox provides the designer with quality products and outstanding service. In continuing that tradition, we have on staff engineers that work closely with architects to provide efficient and effective solutions for their projects. Our AutoCAD design programs allow us to model alternatives and help select the most appropriate products.